The U.S. Department of Energy estimates that computers account for about 7 percent of the electricity used in offices. Despite most computers' energy savings modes, an estimated 30 to 40 percent of them are still left fully powered outside of business hours. This whitepaper explains how organizations can reduce their energy bills by remotely regulating computers. 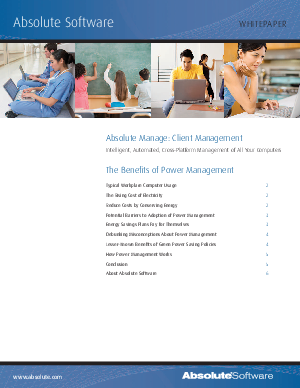 Topics include typical workplace computer usage, how to calculate your potential energy savings, debunking power management myths, and how you can assign multiple power saving profiles to clients.